Virginia Apgar (born Westfield, New Jersey 1909; died New York, New York, August 7, 1974) was a physician who developed the Apgar Score. Newborn babies receive the test, and doctors can then identify those infants who need special attention. Gwendolyn Elizabeth Brooks (born Topeka, Kansas, 1917; died Chicago, Illinois, December 3, 2000) was the first African-American to win the Pulitzer Prize for poetry. Her book, Annie Allen, took the prize in 1950. Children could read some of her poems at: http://www.poemhunter.com/gwendolyn-brooks/. Paul Gauguin (born Paris, France, 1848; died Atoana, Hiva Ova, Marquesas, May 9, 1903) was an artist. 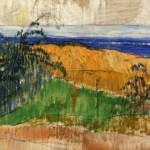 He used bold colors and often painted landscapes. He was a stockbroker before he became a painter. He moved to Tahiti about three years after he became an artist. Visit a website at: Paul Gauguin. Idea: Children could view Gauguin’s work. He and van Gogh actually shared a house for a while. Children could compare the two artists’ works. Nikki Giovanni (born Knoxville, Tennessee, 1943) is an African-American poet and writer. Her works for children include The Sun Is so Quiet and Lincoln and Douglass: An American Friendship. Children could visit her website at: Nikki Giovanni. Georgess McHargue (born New York, New York, 1941; died Groton, Massachusetts, July 18, 2011) wrote books for children. Her works include See You Later, Crocodile and The Talking Table Mystery.